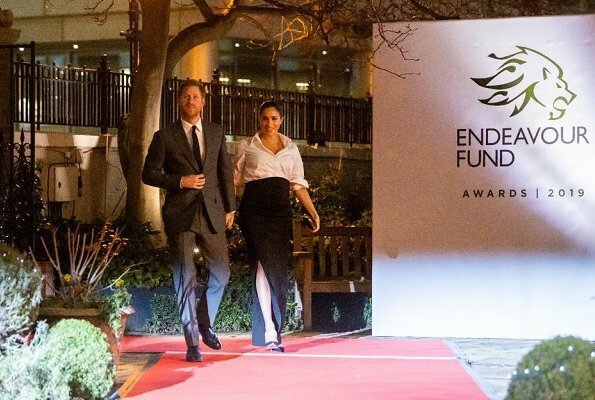 On February 7, 2019, The Duke and Duchess of Sussex attended the annual Endeavour Fund award ceremony held at Drapers' Hall in London. 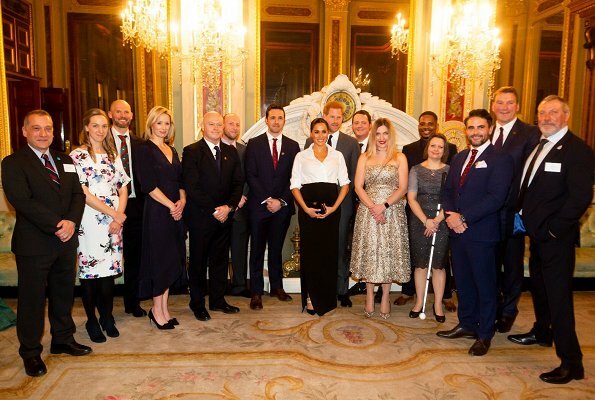 That fund is a project led by The Duke of Sussex and The Royal Foundation, provides financial backing and guidance to programmes and charities across the UK that support thousands of service personnel and veterans reach their full potential. Why Meghan, why? The blouse doesn't fit - no wonder. I do not like antyhing about this outfit. sorry. Don't say sorry for giving your honest opinion. There are probably way more who don't like it and just can't say they don't like it. Great Cause and I'm glad they're highlighting it with their attendance. But, I just don't know what to say about this outfit. The lady needs some good advice - and some good maternity wear. I thought this looked ok from the front, but from the side, it just looks like she was desperate to find something to wear and made do with what she could find (husband's shirt + stretchy skirt pulled over her belly!) And yet I know it was made for her and cost a princely sum. I agree with you; the outfit does look like something awkwardly thrown together in desperation. One can sympathize with a very pregnant lady who is expected to constantly look great in public, but I have to think that there are more flattering options available to the duchess than this. They both look great. 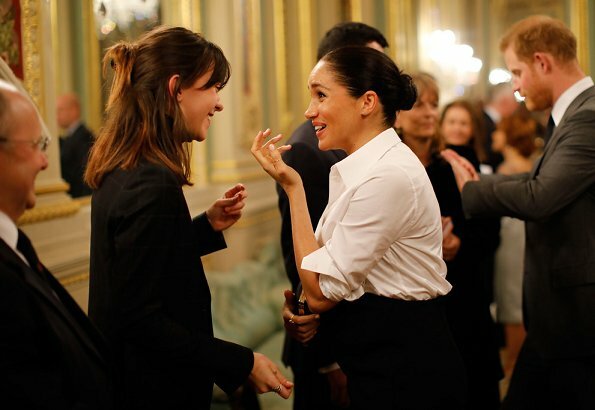 Perfect classic look for happy and so chic Meghan. 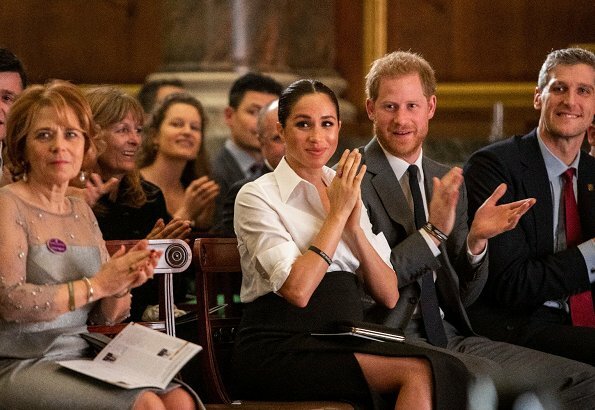 I think it would be hard to find a person who wouldn't like how Meghan looked at Award Ceremony. I think it's awful, good shoes but the rest is a ill fitting mess. This is an awards ceremony for military veterans. The skirt is well designed and made, but the informality of the blouse misses the mark. Well ,everyone has different taste.And I am not saying mine is better than yours. To me she looks very sophisticated , elegant and feminine .The look of a chic woman without trying too much. And that is what is so special in that outfit. . I agree, Annonymous. Meghan's ensemble looks crisp and lovely. She looks naturally sophisticated without trying too hard. Very elegant appearance for a very pregnant lady. I like the idea of this outfit more than the execution. I remember years ago when Sharon Stone did something similar at the Oscars but she wasn't pregnant and it was the 90's! I do love her shoes though and she looks radiant. 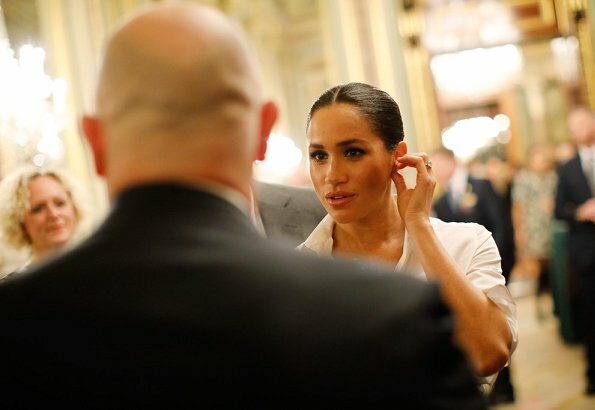 Meghan really has a beautiful face. There is nothing flattering about this outfit. It doesn't even showcase her baby bump. She could have done alot better just buying off the rack. Today it's a total style failure for me, I am a fan of the ever elegant white shirt/black skirt, but this oversize top, and the skirt riding high, just looks terrible. The shoes are to die for. Totally agree. There is nothing elegant in this look except the shoes. The outfit is untidy and ill-fitted.A pity. I was rooting for Meghan to learn how to dress like a royal, for so long, but I give up. I don't understand...this outfit is awful and you can Tell by the pictures that she feels uncomfortable in it. Her hair is weird too. I think she is styling the hair herself, no hairdresser would approve this thightly pulled back bun all the time. Or the messy bun (when it's actually messy, not styled to be messy). She seems to be a nice person, but she should accept some experts advice, or just dress more simplier, but don't wear these silly outfits. 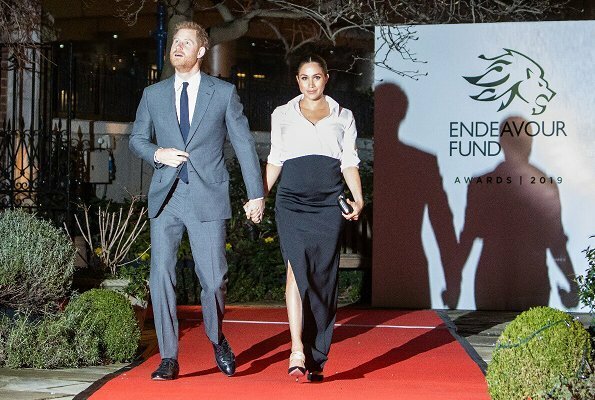 These outfit fails steal the attention from the point of these engagements that she is attending to and her work never will be appreciated even though she is doing a great job. I know that how you look, what you wear shouldn't matter but in today's world it does. Especially when the whole world's eyes are on you. I have no intention to hurt Meghan, I'm not a hater, but this is my honest opinion. Love it - I think she looks great. Only thing I would change would be to stop the skirt split at knee height. I dont like the upper part at all, only the clutch likes me. Loving the outfit, adoring the shoes! Chic as always! They are both luminous. Adorable couple. 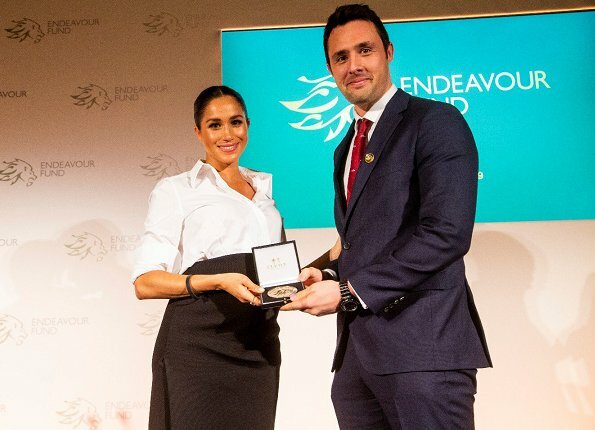 Meghan's outfit was fresh, young, sporty and elegant. Very nice couple. This is a bespoke outfit by Clare Waight Keller for Givenchy. Women have been wrapping menwear shirts since at least the 50s. Audrey Hepburn did it in "Sabrina" in 1954, and Sharon Stone famously wore her husband's shirt to the Oscars in 1998. This look has continued to pop up throughout the decades. Many women have worn the look to formal events. I am not opposed to this look at all. It suits the occasion and is very approachable. I am opposed to dressing in oversized clothing while pregnant to disguise a woman's body. We should be past that by now. I love that she lets her shoes be her accessory. I would rather see fabulous shoes than a lot of jewelry. Her face is beautiful on its own. As for the comment about her skirt being slit too high, Kate has worn dresses that showed more leg when she was walking, and those were some of her best looks. These are young women and must be allowed to be their age. They are not inappropriate. I love this look, and I would wear it myself (sans tummy). 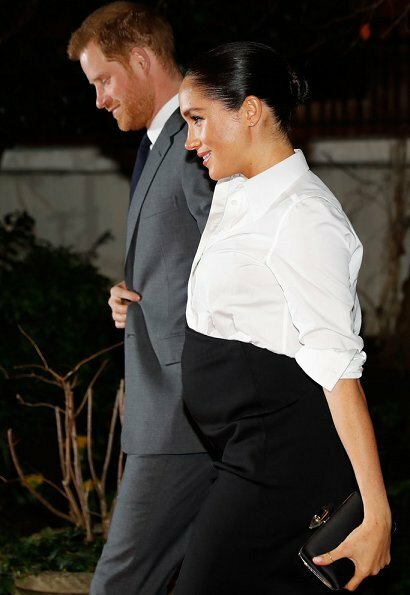 Well said @chardonn8r, I think this is a spectacular look, combining a hight waisted black skirt - good choice to dress a late pregnancy belly - not with a feminine blouse but with an oversized 'boyfriend shirt'. I love it! Together with the pulled back hair and the shoes - you are so right, you don't need much jewelry when you wear the right shoes - this makes a sophisticated modern look. Well done, Meghan, you rock! P.S. She is so hard working in her late pregnancy. I give her credit. And to walk on these high heels, I give her credit too. I could not have managed it :-)) She is glowing whith happiness and confidence, she is doing incredibly well. Harry must be so proud of her! chardonn8r, there are legs and legs. I didn't say the split was inappropriate nor did I make any comment about what Catherine has done. I don't make those kinds of comparisons- they are different women with different styles and totally roles to play. I was referring to my personal taste. Megan is beautiful, but the outfit is awful. 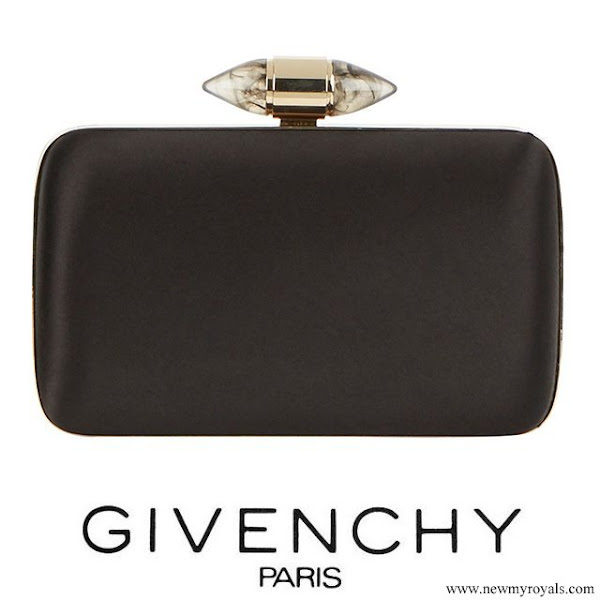 I don’t know what is going on at Givenchy but this dress is terrible. It’s a dress of two halves- a work style white cotton shirt (creased ) and a black long skirt that sadly looks like she is wearing a barrel. 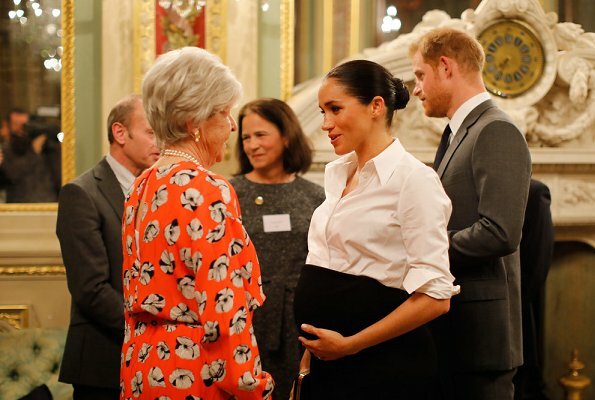 I don’t understand why Meghan insists on wearing very tight maternity wear that emphasise her bump? It looks cheap and tacky. I don’t like comparing but look at the maternity wardrobe of the Duchess of Cambridge to see how to dress beautifully and appropriately when pregnant. Reading all the comments, Cathrine sums it up perfectly. Meghan is beautiful but the outfit is ghastly. 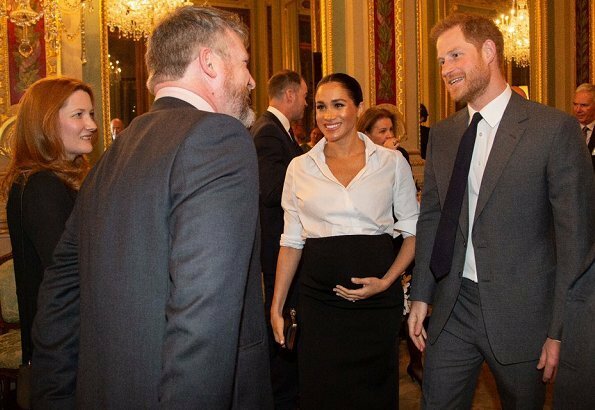 I also totally agree with Joanna's comments about tight maternity wear. It is also perfectly possible to dress in outfits which are flattering without the awful tent like smocks that were around in the 70s and 80s. She need only look at outfits worn by the Swedish princesses or the Duchess of Cambridge. If the baby is due in April, then D of C was at a similar stage of pregnancy at this point last year and was on the Scandinavian tour. Many of the outfits, both daywear and evening wear, were among her best looks of the year ( there was also the Erdem dress so certainly not 100% perfect!) 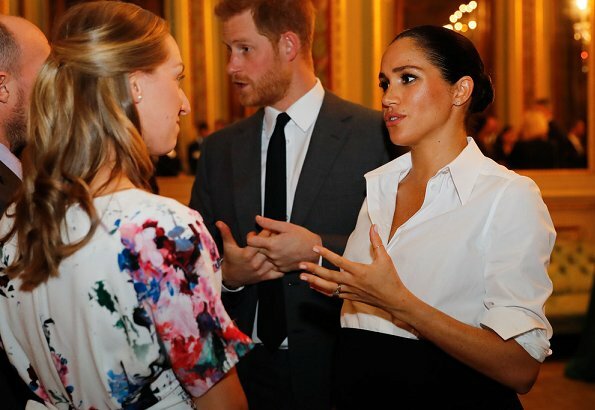 Meghan may not wish to take style tips from her sister in law but surely her stylists could give better advice! I hope she does not take style tips from Catherine. Catherines style is ever the same and would look terrible on Meghan. Hope as well that she did not take style tips. Prince Harry looks mighty fine! I like the color of his suit and that it is not the perpetual blue he was always wearing. It is a very subtle plaid, sharply tailored. What a great look! @KH, yes, we seem often to forget on the men on this site, but I agree with you, Harry looks great, good color and cut. His outfits improved since Meghan is around. Love her shoes very elegant. Her outfit is not the best. Does not fit her very well. Just because it's designer does not mean it's good. Overall I like her style but her clothing sometimes seem too big. I think she needs to slow down and pick outfits than enhance and fit. Wenig passend , wenig Stil !! This outfit was on point with the ceremony. The Duchess appeared graceful and sophisticated. You can see it on the video. Nice white and black combo, love the shoes. But not a great fit, well pregnancy will do this maybe. Hair and makeup very very good. Loving Meghan style: simple, sleek and chic. Poor Meghan & Harry . They have the potential to be happy & do a lot of good things . Props for walking these shoes while pregnant, though! This outfit is a real miss for me. No, pregnant women do not need to wear "tents" today. But the casual, open shirt tucked into this skirt is just not good. 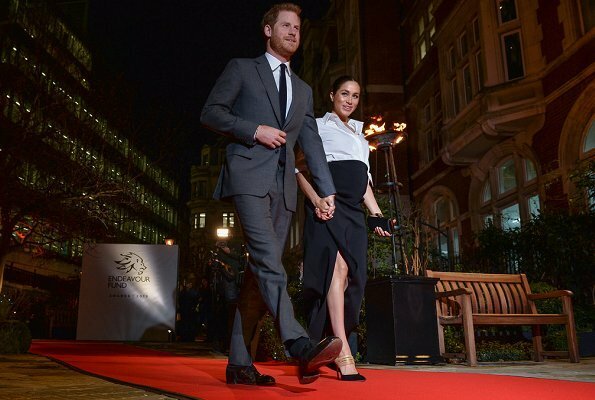 wow she looks great modern outfits for pregnant women, no need for those big size unflattering looks, well done meghan!!!!!!!!!!!!! !